Let your faith be the power that turns the coils of my everwound springs. Initially, I planned on including spells and domains in the same post for Cleric-mas, but I realized that the upcoming summon spells will require a LOT of text. Plus, having the anoint spell as its own post gives me an excuse to use The Malört Song as an epigraph. Welcome to the 12 Days of Cleric-mas! A completely made-up holiday reference I’m using as an excuse to post new ideas and mechanics for clerics in the 13th Age role-playing game. Probably, and even a little silly. But I had ideas for 12 posts about clerics, and it’s the holiday season, so the idea stuck. What are the 12 days? Because the living dead never sleep a lick. Next week begins the ’12 Days of Cleric-mas,’ a series of posts in the vein of 13th Age Monthly, but with a sillier name. Oh, and they’re all focused around new domains, spells, and possibilities for playing clerics in 13th Age. A couple of the posts reference undead player-characters, due to the fact that I’m drawing from the Midgard setting for inspiration. This setting, published by Kobold Press, is a little more far-flung and Grimm than a lot of Western F20 settings. Its take on deities and how they overlap amongst cultures is what grabbed my attention. I sit at our new computer desk, listening to a shuffling playlist while the laptop downloads the newest OS, and I wonder what to do about all the written and unpublished stuff on said laptop. I wonder about that because I’m updating the OS, which always gives me slight anxiety around all our files, most of which are either my words or Steph’s pictures. Some of those words find publication, though it’s very much a tip/iceberg ratio. Steph and I use shared documents to collaborate on our J&STAC columns for the Addison Recorder. This blog was meant to be a clearinghouse for a lot of the random (often game-related) words, for the content that wasn’t a fit at the Recorder or other places. But then I started mixing in freelance and other blog work, and the purpose became muddled. I was writing 10,000 words a month for the Recorder, so I started using this site to promote that — but Twitter seemed a better avenue for that. I was going to potentially write on tabletop game topics for another site, so I stopped doing so here — but then communication with the other site disappeared. Meanwhile, waiting around to hear back or figure out what I should do just causes this blog to sit around unused, which defeats the above-stated purpose. So I might as well start publishing stuff here while I wait. Speaking of, the download for the new OS is ready. Time to shrug in the face of anxiety and hit the button. I’ve been surprised how much I’ve enjoyed creating material for 13th Age games. It’s as though, after decades of supernatural and horror-based RPGs, my brain is throwing out all the fantasy & myth ideas it’s been saving up. Not surprisingly, the influence of darker RPGs still pokes through, as evidenced by a cursed magical item I created for a recent campaign. Another dispatch from the Addison Recorder, wherein Steph and I look back at some of the new #1 comic book issues that were released in late September through October. I learned very quickly that a lot of books have problems with a #1 issue — they spend so much time with setup, introductions, and exposition that the issue is usually over just as you get into it. 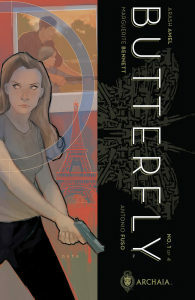 That said, I was very pleasantly surprised by the new mini-series Butterfly, from Archaia. My favorite of the month. I’ve been rather busy over at the Addison Recorder. Yesterday, Steph and I kicked off our biweekly column about comic books & graphic novels. 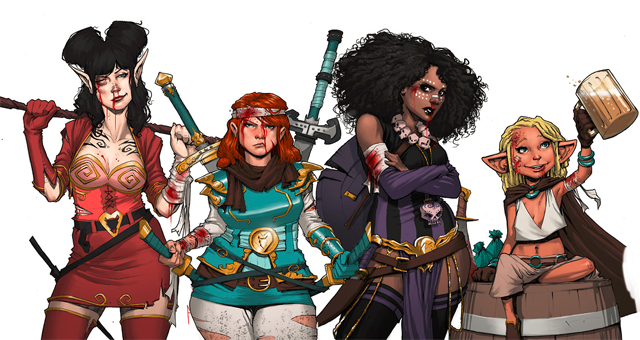 Our inaugural discussion centered around Rat Queens, a terrific series that everybody needs to read. Seriously. Read it. Historically accurate representation of the 2014 U. of Michigan football program. Over at the Addison Recorder, Bean invites me to assist with his weekly NCAA football pick ’em. I make a lot of references to the Punic Wars, he adds a lot of gifs from the Hannibal TV series. We’re serious prognosticators, don’t ya know. Talking 13th Age on the Modifier Podcast! Copyright © 2019 Everyday Dramaturgy. Powered by WordPress and Alétheia.